You probably have figured out that you can control Aquaero 5 not only via Aquasuite 2012, but through front panel too. Unlike previous generation of controller, Aquaero 5 features nearly whole set of settings required for full configuration of the device though front panel. Menu navigation is organized via three main buttons and in case of XT version, via four additional programmable buttons and a Remote Control Unit. First thing you notice when looking at Remote Control Unit at is it has QWERTY button layout. Digits and Symbols are entered by honing green or blue ALT button respectively. Larger buttons in upper right corner make menu navigation much faster and easier. Just opposite these buttons you’ll find a joystick, that could replace PC mouse, although the cursor moves very slowly. More functions can be revealed with IR-receiver connected to Aquaero 5. Remote Control Unit is quite small, 9x9cm. Smooth curves at the back add comfort while holding it in hands. 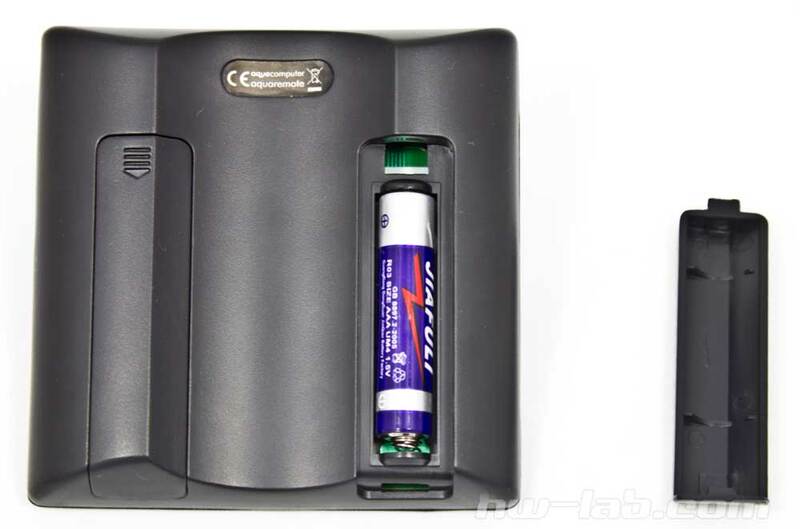 The unit is power from two AAA standard batteries that are included with the package. Moreover, Aquaero 5 can show “Warning/Alarm” message directly on controllers display. In ”Configuration” settings select “Temperature exceeds limit” alarm type. “Limit for alarm” sets the value that will trigger the safety feature when reached. In “Set alarm level” select “Alarm_Warning 4”. After doing so, your system will automatically shut down when temperature of selected sensor will exceed the “Limit for alarm” value. Moreover, the relay will switch for 2 second only and return to its initial state automatically. We recommend these particular relay settings, as controls made though front panel does not require starting of Aquasuite 2012 or eve OS. Besides temperatures, you can set alarm/warning action to fans speed signal, flow rate, water level in reservoir (requires “Tubemeter”), as well as operation status of Aquacomputers pumps. We have already mentioned that Aquaero 5 XT (or Pro) can have special IR-module connected. 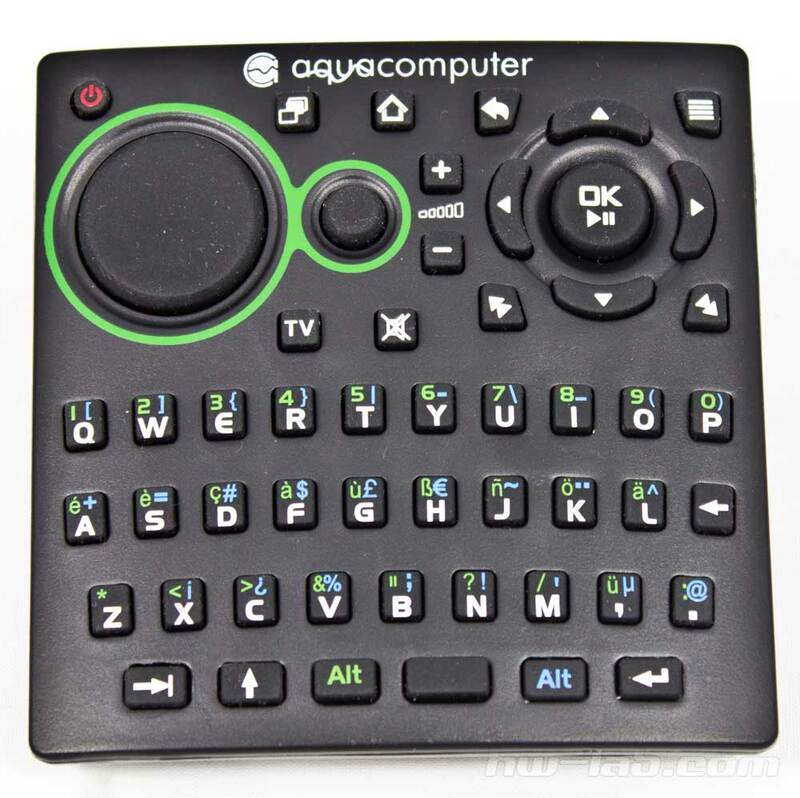 Not only it can provide functionality of a keyboard+mouse set, but allows to turn on/off PC with just a push of a button on remote control unit. Moreover, Aquaero 5 XT (or Pro) can learn IR commands from devices other that PC, for example, you home cinema.